MEMPHIS, Tenn. — ServiceMaster announced on Feb. 27 that it had entered into an agreement to purchase and combine its Terminix national account pest control operations with Copesan Services. Copesan, an alliance of regional pest management providers, is one of largest national providers of commercial pest management services throughout North America. Throughout the call, Varty stressed Terminix’s commitment to strengthening its commercial pest business. In addition to the Copesan acquisition, Terminix bolstered its commercial business with the addition of Kelly Kambs, who was named president of Terminix Commercial on Feb. 20. Kambs, who joined ServiceMaster from CPG Building Materials in Chicago, where she served as senior vice president, will work closely with Copesan President Deni Naumann, who has led that organization since 2006. FRIDLEY, Minn. — Plunkett’s Pest Control on Feb. 1 announced it had acquired Varment Guard Environmental Services, based in Columbus, Ohio. The merger represents the union of two highly regarded, family-owned companies and propels Plunkett’s into new markets in addition to expanding its service specialties, the firm said. The merger expands Plunkett’s service area from 11 states to 17 states and brings the company’s annual revenue to about $55 million. Varment Guard is the largest acquisition in Plunkett’s history. SANTA FE SPRINGS, Calif. — Target Specialty Products, a provider of pest control and pest management solutions, turf and ornamental solutions, application equipment, supplies and education and training programs, opened its 43rd branch in Denver, continuing several years of rapid growth. The company says the new location will meet the high demand in the Denver market and will further Target Specialty Products’ continued industry leadership by supporting accounts with stocking and on-time delivery programs. Target Specialty Products is headquartered in Santa Fe Springs, Calif.
ATLANTA — Rollins in January announced that Beth Chandler, general counsel, has been appointed to the position of corporate secretary. Tom Luczynski, previous corporate secretary, has been elevated to the position of president of Orkin Global Development and International Franchising, as well as assistant corporate secretary. Also in January, the company announced that through its wholly-owned subsidiary Orkin, it has expanded its presence in South America, Europe and Africa with the addition of six new franchises in the second half of 2017. The franchises are located in Northeast Brazil; Brasilia, Brazil; Argentina; Kenya; the Netherlands; and Azerbaijan. The Orkin brand is now represented in 53 countries. “We are excited to expand our presence in these areas and believe that it provides a great opportunity for us, as we continue to grow our Orkin brand internationally,” Luczynski said. Left to right: Dr. Clyde Ogg, Dr. Shripat Kamble, Dr. Bob Davis and Dr. Timothy Husen at February’s Nebraska Urban Pest Management Conference. LINCOLN, Neb. 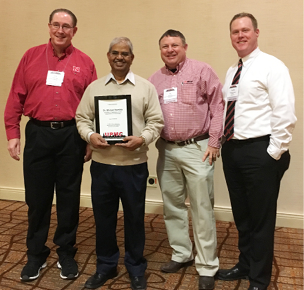 — At February’s Nebraska Urban Pest Management Conference, organizers took time to recognize Dr. Shripat Kamble, longtime professor at the University of Nebraska-Lincoln. Kamble, who recently ended his 38 years of field work but continues to teach and research at UNL, ran the highly regarded conference for more than 20 years. Kamble joined the university and in 1989, and when then-University of Nebraska professor Dr. Roger Gold left for Texas A&M University, he was elevated to his current position. Kamble is responsible for developing and coordinating pest management education programs for PMPs, as well as overseeing research efforts that focus on genomic research or the molecular structure of an insect. During his tenure, Kamble’s research and extension projects have been awarded more than $3.72 million in research grants, and he has been published in more than 150 research and extension publications. South Lake Tahoe, Nev. — The Pest Control Operators of California’s annual expo takes place June 20-22, at Harrah’s Lake Tahoe Resort, South Lake Tahoe, Nev. The two-day event includes multiple networking opportunities, an exhibitor hall filled with new products and services, and educational seminars. Important regulatory updates also will be provided. Learn more. RIVERSIDE, Calif. — Renowned spider expert Rick Vetter, a retired entomologist at the University of California, Riverside, and pest control consultant Stoy Hedges have published a new paper on Integrated Pest Management (IPM) of the brown recluse spider. The guide aids PMPs in the proper identification and management of the brown recluse. It reviews existing research and summarizes best practices for integrated pest management of the brown recluse spider. The guide can be accessed here. INDIANAPOLIS — Insects Limited and FSS will host the 13th Fumigants & Pheromones Conference June 12-14 at the Indiana State Museum in downtown Indianapolis. The keynote speaker is Dr. Steve Yaninek, former department head and current professor at the Department of Entomology, Purdue University. “We are honored to have Dr. Yaninek share his many stories and tell about pest management around the world,” Mueller said. The conference will feature two days of speakers and classroom interaction, a conference dinner and two hands-on practical workshops from which to choose. For more information and conference registration visit www.insectslimited.com. BRYAN, Texas — In order to fulfill its mission to connect and enrich the urban pest management industry, Pi Chi Omega is branching out to industry meetings around the country. To that end, Pi Chi Omega made its debut at the Texas A&M University Urban Pest Management Conference in January where students and members met with Dale Baker, president, and Cassie Krejci, director of Pi Chi Omega. Membership information, scholarship applications and discussions about what Pi Chi Omega is were shared with Texas A&M conference attendees. One of Pi Chi Omega’s strategic activities centers on connecting members by providing networking opportunities for each segment of its membership to interact and elevate the technical knowledge within the industry. Pi Chi Omega says it wants to “raise the bar” within the industry by connecting students, educators, technical professionals, manufacturers and pest management professionals. At the 2018 Purdue Pest Management Conference, Pi Chi Omega kicked off a series of social events at the Union Rack & Roll where more than a dozen members congregated in the basement of the Purdue Memorial Union for the first-ever Bowling & Billiard Blast. On the first night of the conference, Pi Chi Omega hosted a hospitality suite for members. JT Eaton provided the food and beverage. Pi Chi Omega held a membership meeting on Tuesday evening in the West Faculty Lounge, which was attended by 33 Pi Chi Omega members and potential members. During the event, Pi Chi Omega also held a short business meeting to update members on the work of the organization and its plans for the coming year. The board recommended 23 new members to the membership, a nearly 6 percet increase in membership; all were unanimously approved. An honorary membership was approved to be conferred on Millard Oldham Jr. and Ada Oldham for their dedication and service to the industry. EAST GRANBY, Conn. — Wildlife Control Supplies (WCS) announced the acquisition of Batcone from Jim Dreisacker, inventor of the Batcone and Pro-Cone line of Bat and Multi-use Professional Wildlife Excluders. ENNIS, Texas — Polyguard Products announced that its TERM Barrier System received an evaluation report as a Termite Physical Barrier from the International Code Council. Polyguard’s TERM Barrier System joins Termimesh as the second Termite Physical Barrier evaluated by the ICC. TERM is a termite exclusion system built into the “building envelope,” and is the first building-wide, non-chemical pest exclusion system available to designers and builders for sustainable construction. There are several TERM components where installation by a pest management professional is required or preferred. These are sealant barriers for plumbing or electrical penetration, combination barriers for bath traps and blockouts, and sill barriers and particle barriers at exposed building perimeters. To meet requirements for the ICC’s AC-380 Termite Physical Barrier standard, TERM Barriers were field tested at four termite-infested sites against both Coptotermes formosanus and Reticulitermes flavipes. In these five-year field trials, wood protected by TERM Barriers suffered no damage, while all exposed wood control samples were destroyed, the company said.